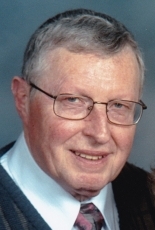 CAMERON, Gerald Jack Duncan "John"
It is with great sadness that the Bailey family announces Earl’s passing, peacefully in his 83rd year at Lakeridge Health, Oshawa, on Friday April 6th, 2018, with his wife Jean at his side. Beloved husband of Jean (Samells) Bailey, and loving father and grandfather to Craig Bailey and wife Tricia (Shannon, Owen, Karen), Todd Bailey and wife Panagiota Dafniotis (Alexander, Victoria) and Lynn (Bailey) Carter and husband Kent (Holly, Wesley). Born in Trois Riviéres, Québec, Earl grew up in Welland, Ontario, married Jean in 1961 and settled in the Oshawa area. Besides being a devoted husband, son, brother, father, grandfather and friend, Earl practised law in Oshawa and Port Perry, was a board member of Kingsview United Church, a former Boy Scout leader, a past-president of Oshawa Little Theatre and the Westmount Kiwanis Club, and a former chairman of the Oshawa Kiwanis Music Festival. Earl was passionate about serving his community, and also found ways to give back through his love for music as a member of the Westmount Kiwanis Wanderers musical group. The family would like to thank the wonderful staff at Extendicare Oshawa for their compassionate and understanding care. A memorial service will be held at Kingsview United Church, 505 Adelaide Ave. E., (at Wilson Rd. N.), Oshawa (905-436-2000) on Monday May 14th, 2018 at 2:00 p.m. Visitation will be held starting at 12:00 p.m. with refreshments after the service. In lieu of flowers, the family encourages friends to consider a donation to Kingsview United Church, Parkinson Canada or the charity of their choice. Cremation arrangements entrusted to McINTOSH-ANDERSON-KELLAM FUNERAL HOME LTD., 152 King St. E., Oshawa (905-433-5558). Online condolences may be shared at makfuneralhome.com. Online condolences may be made by clicking the Leave Condolence button on the left. Keeping Jean & family  in thoughts & prayers. May the memories of wonderful family moments bring peace. He made everyone feel special, in our family. A true gentleman. Our annual visit to Port Perry was the highlight of the year and Earl was a big part of that. His warm handshake, his friendly smile and his sharp sense of humour were wonderful. I really appreciated his willingness to sit and listen to me as a boy, as a teenager, as a young man, and most recently as a middle aged father. Those times meant the world to me. I think of the advice he has given me about kindness and thoughtfulness and the importance of family every day. I loved how we put on the morning cartoons for myself and later for my kids and how he set out comics and other reading material at the cottage. I loved how he got my kids out in the rowboat and throwing the ball and so much more. We were blessed to know him and thankful he was in our lives. Please accept our condolences, Jean. Mr Bailey was a treasured client at the bank when I worked there in the 80’s, always very pleasant and helpful to us when we needed a signature or help with an estate file. Our Deepest Condolences to Jean and the Family. Keeping You All in Our Thoughts and Prayers at this Very Sad time. I am so sorry to hear of Earl’s passing. He was a real gentleman and I enjoyed chatting with him at church. May God bless you and your family at this difficult time. So sorry to hear of Earls passing. I remember when he use to come to aerobics too. My thoughts & prayers go out to you & your family. Betty and I were sad to hear of Earl's death. He was our lawyer for many years and did a wonderful job. He also had a good sense of humour. We hope  that you can get strength from your family to help you in this difficult time. Sad to hear of Earl’s death. My condolences Jean, to you and your Family. Very sorry that I am unable to attend the Menorial Swevice. Our thoughts are with you. We have fond memories of the time we visited the cottage when Emily was very young and how you took care of her and made us feel so welcomed. Sending you Craig, Todd & Lynn our deepest condolences & prayers. Please verify the reCaptcha below in order to submit your condolence. © copyright 2011 McIntosh-Anderson-Kellam Funeral Home Ltd.